Thomas & Betts Straight liquid-tight strain relief cord connector of trade size 3/4-Inch, is suitable for use in hazardous locations where general-purpose equipment is specifically permitted by NEC. The cord connector in metallic color, features durable die-cast zinc construction. Connector offers grounding continuity of cable armor and forms a non-slip connection or termination for flexible cord or cable. Cord connector has NEMA 3R, 4, 6 and 13 rating. 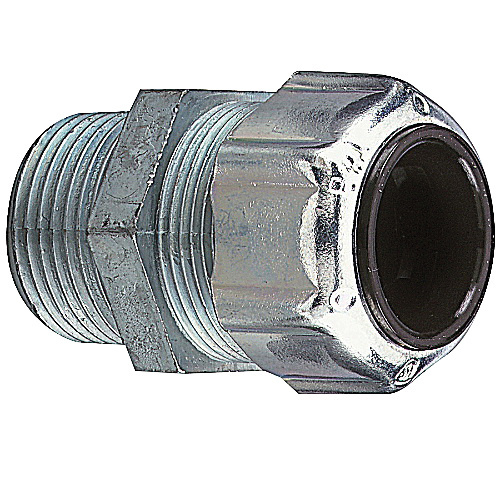 It accommodates conductor of size 0.25 - 0.375-Inch and withstands a temperature rating of 105 deg C.
This connector forms a mechanical grip and water- and/or oil-resistant seal for cord and unarmored or jacketed armored round cables. This NPT connection cord connector has 14.287 mm long thread 13/16-Inch Dia throat. The cord connector is convenient to use in S, SO, SV, ST, STD, SJ, SJO, SJT, SJTO and SVD cord and cable type. It has a dimension of 1-3/8-Inch Dia 1-3/4-Inch. Cord connector is UL listed, CSA certified and meets NEC standards.